Frozen shoulder, also called adhesive capsulitis, causes pain and stiffness in the shoulder. Over time, the shoulder becomes very hard to move. It most commonly affects people between the ages of 40 and 70, and occurs in women more often than men. Your shoulder is made up of three bones: your upper arm bone, your shoulder blade and your collarbone. The shoulder is a ball-and-socket joint: the ball, or head, of your upper arm bone fits into a shallow socket in your shoulder blade. 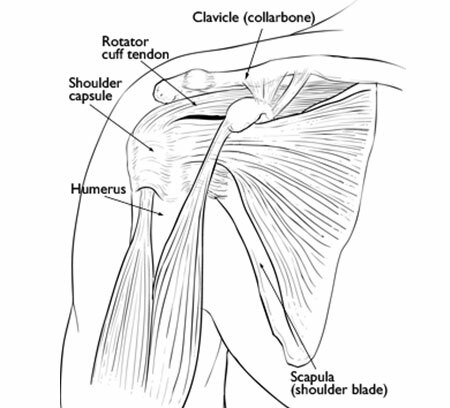 Bursa- There is a lubricating sac called a bursa between the rotator cuff and the bone on top of your shoulder (acromion). The bursa helps the rotator cuff tendons glide smoothly when you move your arm. The causes of frozen shoulder are not fully understood. A few factors may put you more at risk for developing frozen shoulder. Other diseases- Hypo/Hyperthyroidism, Parkinson's disease, and Cardiac disease. Immobilization- due to surgery, a fracture, or other injury. X-rays - X-rays may show other problems in your shoulder, such as arthritis. Magnetic resonance imaging (MRI)- These studies can create better images of problems with soft tissues which can cause similar symptoms such as a torn rotator cuff. Magnetic resonance imaging (MRI) scans- These studies can create better images of soft tissue and find damage to the labrum and articular cartilage. Injecting dye into the joint during the MRI may make the damage show up more clearly. Ultrasound- These studies can create better images of problems with soft tissues which can cause similar symptoms such as a torn rotator cuff. Frozen shoulder generally gets better over time although the time frame is uncertain. The focus of treatment is pain control and restoration of motion/strength through physiotherapy. Medications - Pain Killers and Non-Steroidal Anti-inflammatories are the initial line of treatment in most patients. Steroid injections - Cortisone is a powerful anti-inflammatory medicine that is injected directly into your shoulder joint. Physiotherapy- Specific exercises will help restore motion and includes stretching or range of motion exercises for the shoulder. Heat may be used to help loosen the shoulder up before the stretching exercises. Manipulation under anesthesia - During this procedure, you are put to sleep and doctor will force your shoulder to move which causes the capsule and scar tissue to stretch or tear. This releases the tightening and increases range of motion. 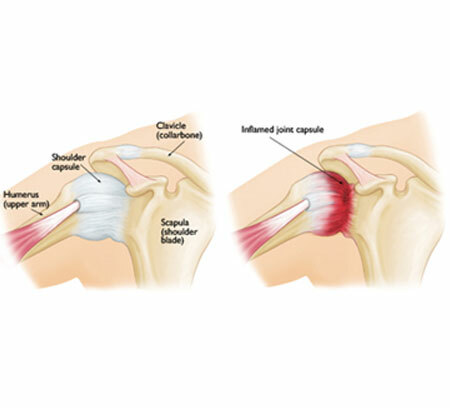 Shoulder Arthroscopy - In this procedure, your doctor will cut through tight portions of the joint capsule. Recovery times vary, from 6 weeks to three months. Your commitment to therapy is the most important factor in returning to all the activities you enjoy. Long-term outcomes after surgery are generally good, with most patients having reduced or no pain and greatly improved range of motion. In some cases, however, even after several years, the motion does not return completely and a small amount of stiffness remains. Although uncommon, frozen shoulder can recur, especially if a contributing factor like diabetes is still present.